A report in ANS-288 discussed an experiment operating with the WSJT-X FT8 digital mode via satellite. Satellite operators have gained more experience with this mode over this past week. As a result of on-the-air observation other satellite users planning to try FT8 or MSK144 modes via satellite are encouraged use caution using these modes and possibly avoid their use completely in light of problems. 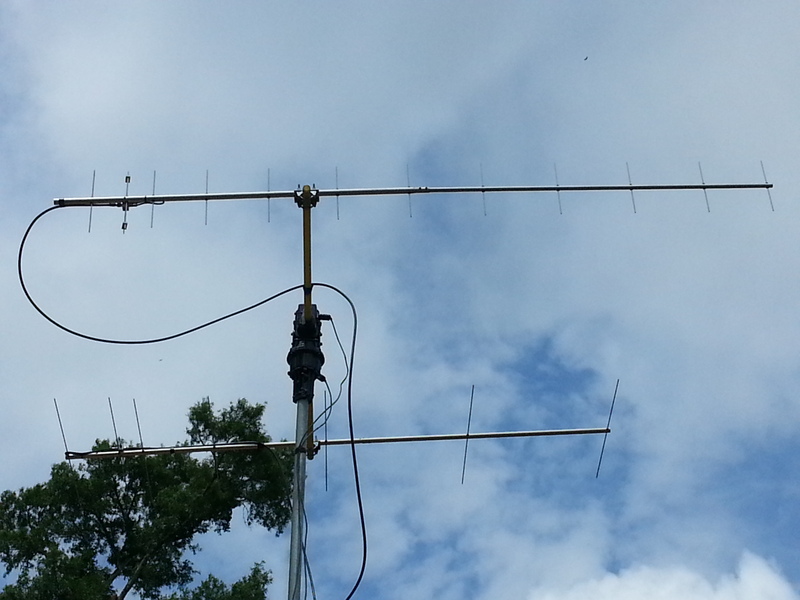 Dave, KG5CCI wrote, “He noticed a very hard time getting into the transponder. The pass was nearly overhead, and the 3w-4w that is normally sufficient was barely cutting it. I also noticed it was ‘up and down’ alot, whereas some moments it was easy to get in, then it would be nearly impossible. There were also pockets of ‘noise’ all over the transponder, that sounded somewhat digital, but I just couldn’t place them.” Further investigation revealed that an MSK144 signal in the transponder passband was causing the problems. HamRadioNow: Look! Up in the Sky! 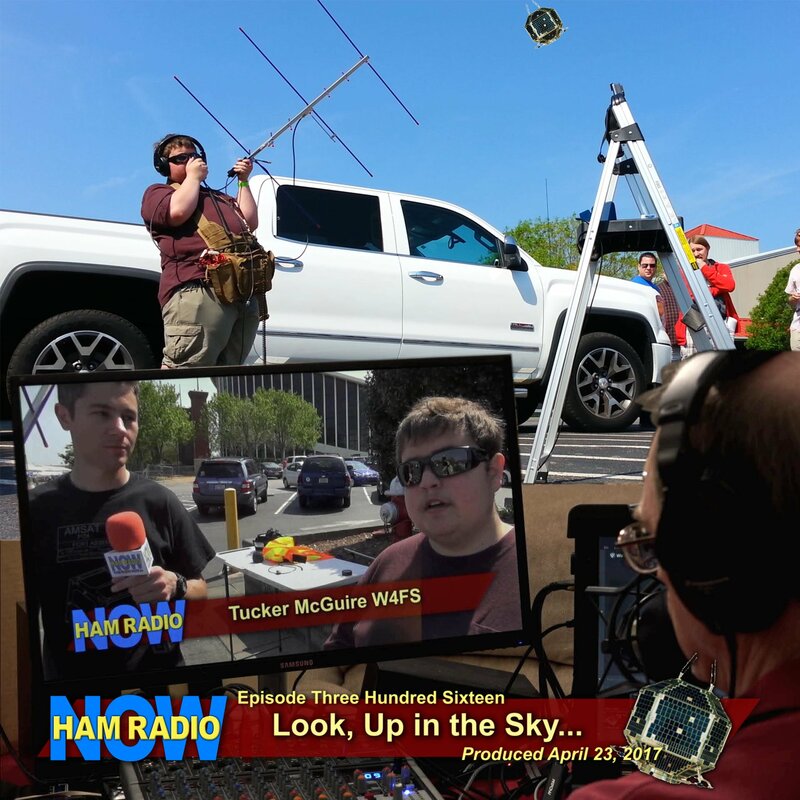 The bulk of this episode is an on-location interview with two Raleigh NC area hams who gave a couple of live demonstrations of operating through satellites at the Raleigh Hamfest, April 15, 2017. There’s some banter between hosts David Goldenberg W0DHG and Gary Pearce KN4AQ back in the studio. And toward the end Gary announces a Viewer Challenge that we’ll detail down below. The satellite hams are John Brier KG4AKV and Tucker McGuire W4FS. At 18 years old, Tucker is a relatively new ham who first started operating satellites last summer, and quickly jumped into the deep end. John’s been around longer, but ham radio satellites and space operation captured his focus, too. He produces videos about it on his YouTube channel, Space Comms. Links below. Gary talked to John and Tucker after they completed their second demo, and he edited a little of each demo into the interview. There’s video of all of both demonstrations on YouTube. John shot himself operating through ‘Saudi-Sat’ SO-50, a “Mode J” FM crossband repeater (145.850 MHz uplink and 436.795 MHz downlink). John used three cameras (including a GoPro on a headband for a unique view). Gary edited the video and put it on the HamRadioNow YouTube channel as an extra bit if video. Gary added two more cameras to the mix to shoot Tucker operating through FO-29, a Japanese satellite that uses a 100 kHz wide ‘linear transponder’ for mostly SSB and CW (and NO FM, please) between two meters and 70 cm. There’s a few minutes of that demo in this episode, and the whole thing is on John’s Space Comms channel. 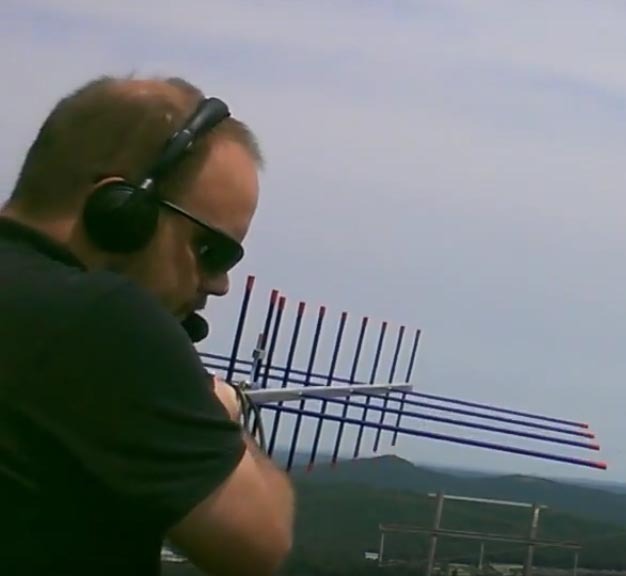 On August 27, 2015, Dave Swanson KG5CCI and Christophe Lucas F4CQA achieved a record-breaking 7599 km contact on the amateur radio satellite FO-29. This was not a scheduled contact, I simply answered Christophe’s CQ call. I knew it was a good contact at the time, but as I was portable up on Arkansas’ Shinnall Mountain, I did not have the resources available to calculate distances. After returning to my office I began to log the contacts I had made, and noticed the “general” distance between EM34 and JN17 was in excess of 7500 km. About the same time I came to this realization, my email chirped with a message from Christophe, who had came to the same conclusion. After some quick exchanges, and verifying 10 digit locators, we have settled on an official distance of 7599.959 km between my grid of EM34ST11TL and Christophe’s grid of JN17EA22OT, using the http://no.nonsense.ee/qth/map.html website for calculations. To the best of our knowledge, referencing data found on AMSAT-UK’s website his breaks the previous distance records of 7537.799 km between W5CBF and G4DOL, and the 7538.685 km contact between K4FEG and DK1TB. I had my camera setup to record the pass as well. 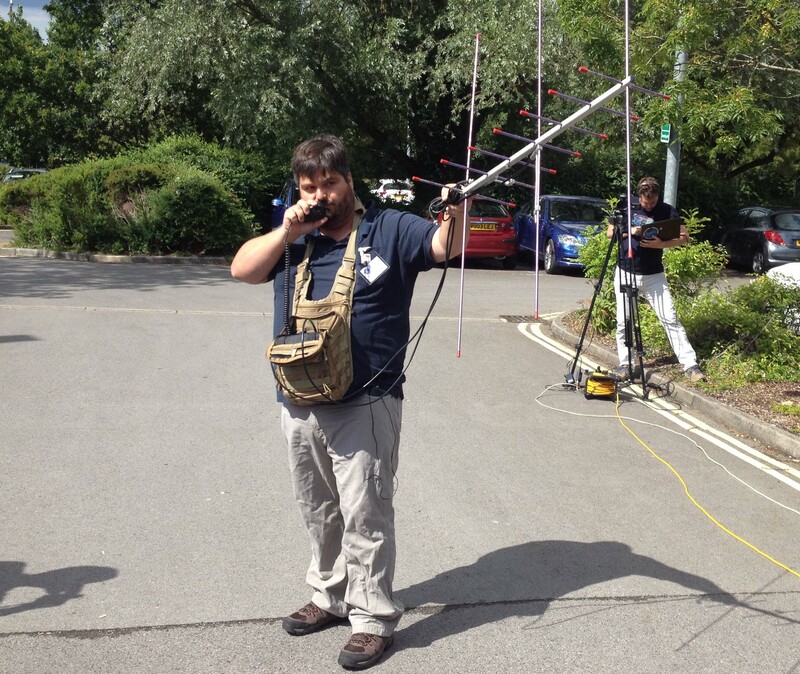 His portable station comprised two FT-817’s with an Arrow 145/435 MHz antenna. Thanks to Wouter Weggelaar PA3WEG for the video. On April 27, 2015 at 1901 GMT, Cuban radio amateur Hector Martinez W5CBF/CO6CBF achieved a 7537.8 km DX contact with UK amateur Peter Atkins G4DOL via FO-29. I am pleased to report that Peter G4DOL and I had another extreme QSO on FO-29. It is my furthest contact on the birds! Back on October 2013, Peter and I had a very nice contact between EL92sd, Cienfuegos, Cuba and IO80so, Weymouth area, UK. 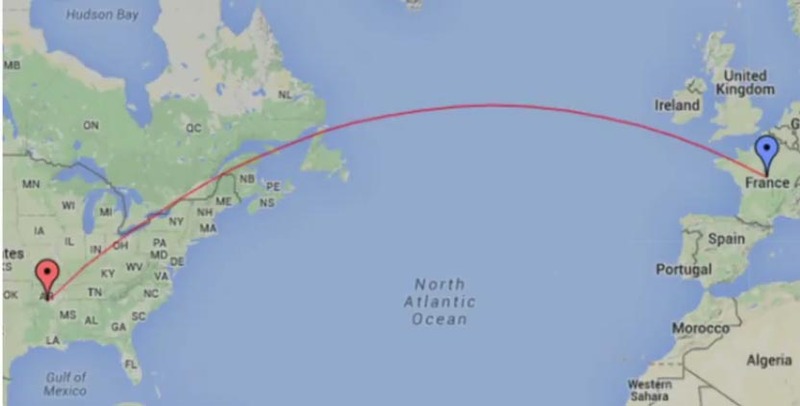 It was a 7286 km contact and probably the first contact between UK and Cuba on FO-29! Peter and I desired to try again on FO-29, this time between EM21hs, Texas, US and his habitual spot in IO80so. We were able to complete a very nice CW contact on the 92319 orbit of FO-29. Peter had just 0.1 degree as maxim elevation while I had 0.8 during the 80 seconds mutual window. 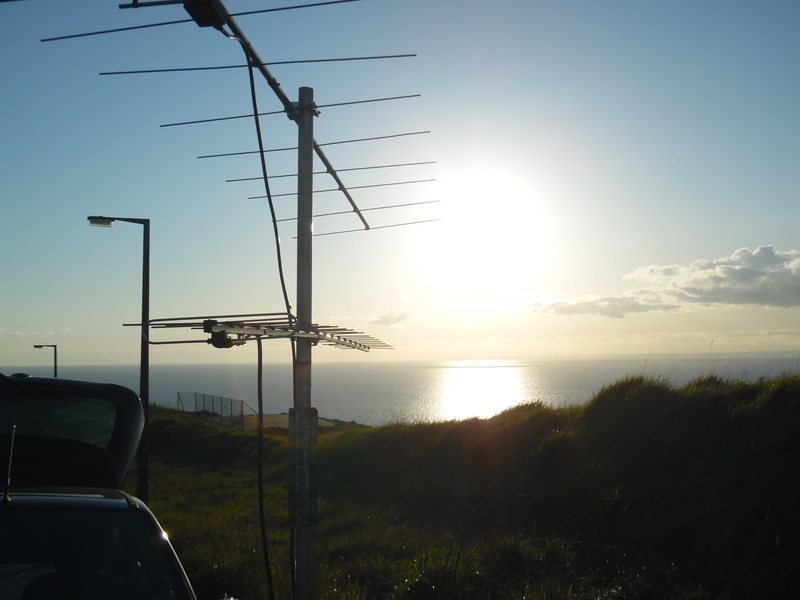 As before, Peter did all the hard work by driving until his habitual spot at a cliff-top and setting up his “portable satellite station” (19 elements Yagi for 435 MHz and 10 elements Yagi for 145 MHz both with horizontal polarization). FO-29 was sounding really good on these orbits. It was a solid 559 satellite contact, we were very impressed. UPDATE 2015-05-08: K4KEG has now revised his distance to 7,538.685 km. This puts his contact with DK1TB just ahead of that of W5CBF and G4DOL. It appears that an even longer distance is achievable. It has been reported that FO-29 has a “theoretical maximum range” of 7502 km, but I guess that at least 7600km is doable. We will try to break our own record! This contact was possible thanks to the great feature implemented on SatPC32 V12.8b. There is an option of seeing the frequency you are at the satellite receiver at any time during a pass. It allows the operators to tune the right frequencies and attempt a contact without having to search for each other. Thanks very much to Peter for his persistence, effort and all the fun! 8-year-old radio amateur Hope Lea KM4IPF made her first contact just 45 minutes after her callsign appeared in the FCC database. 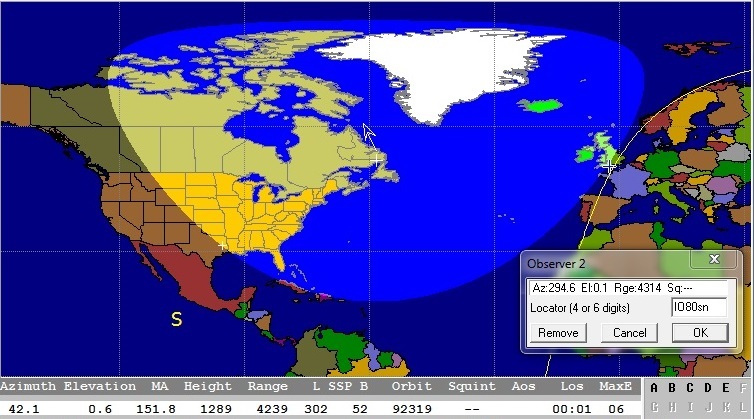 The contact with Arthur K4YYL, via the FO-29 satellite, took place on March 11, 2015 at 2100 UT. Her elder sister Faith WA4BBC and brother Zechariah WX4TVJ got to work K4YYL as well. They had both gained their US Technician licenses (equiv UK Foundation) in February and upgraded to the US General (equiv UK Intermediate) a couple of weeks later. Hope’s younger sister is studying for her licence. Watch KM4IPF Makes her FIRST amateur radio QSO!